Italian tourism hotspot Cinque Terre is fuming about flip-flops. But it’s not that this flimsy plastic toe-dividing footwear is too tacky for the picturesque coastline; it’s a safety issue. Italy’s Cinque Terre National Park authority has announced that it will begin fining ill-prepared tourists climbing the coastline’s rugged cliffs in flip-flops or sandals, with fines between €50 (CAD$75) and €2,500 (CAD$3,770). It's all because mountain rescue teams are getting sick and tired of rescuing visitors on the mountainous walkways. The national park authority is running a public information campaign warning tourists about the dangers of climbing the cliffs without appropriate footwear. 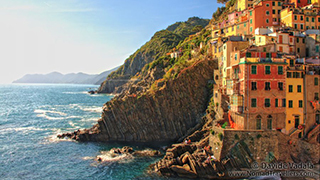 Flyers and online warnings will advertise the fines, including when users purchase a Cinque Terre card which allows them use of all the connecting park buses and trains and access to the trekking paths. The Comandi Regione Carabinieri Forestale -- a law enforcement group – will also work together with those who monitor the trails to inform visitors of the ban. Currently, the English-language version of the park's website advises hikers to only go on trails which suit their skills and to bring sun cream, a hat, hiking boots, food and other supplies. As the UNESCO World Heritage Site receives more and more visitors each summer, the move to ban flip-flops actually has a larger purpose. Ultimately, Cinque Terre is just another Italian destination trying to deal with the increasingly omnipresent problem of overtourism. A local media outlet is reporting that this year, visitors between April and October are expected to be up to 750,000 from last year's 450,000, with day-trippers from cruise liners accounting for much of the rise. As CNN reports, there has been discussion of Cinque Terre taking the lead from Venice and introducing a tourism tax. In the past few months, Rome passed laws banning street drinking, organized pub crawls and taking a dip in the city's fountains while over in Venice, the city’s mayor proposed fines for anyone sitting down in an undesignated spot.